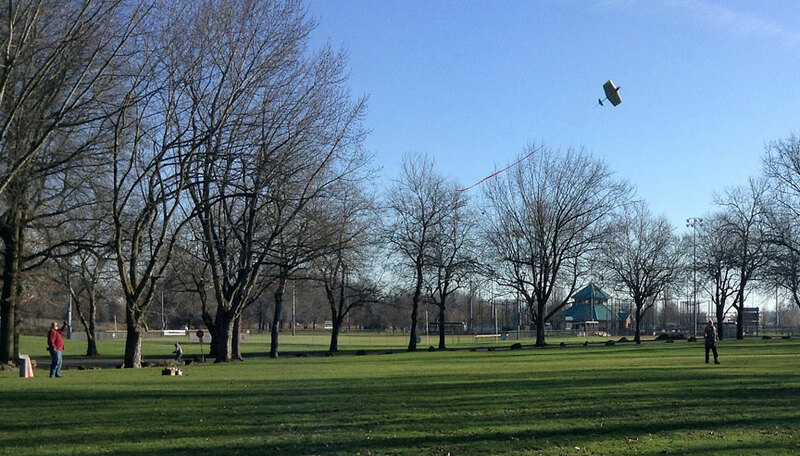 A big group of fliers turned out on New Year's Day in Portland for Oregon Flying Fun No. 1. From left: Richard Entwhistle, Dave Royer, Leighton Mangels, Bill Lee, Don Curry, Tom Brightbill, Ron Anderson, Robert Ladd, Terence Bardue, Robin Gearn, Gary Harris, Dorothea, Darrin and Eli Bishop; kneeling are Jim Cameron, Doug Powers, Tim Wescott. Barbara White photo. 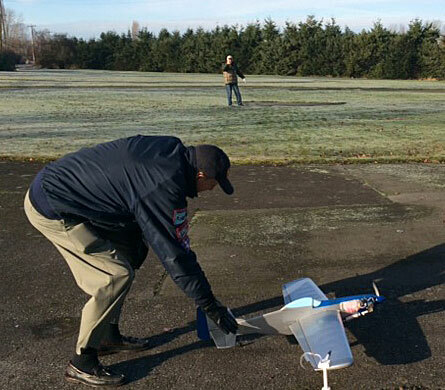 Traditional Northwest fun-fly events celebrated the beginning of 2018 in Portland, Ore., and in Richmond, B.C., on Jan. 1. In Portland it was Oregon Flying Fun No. 1, hosted by the Northwest Fireballs, which was the first of four traditional Oregon winter fun sessions. 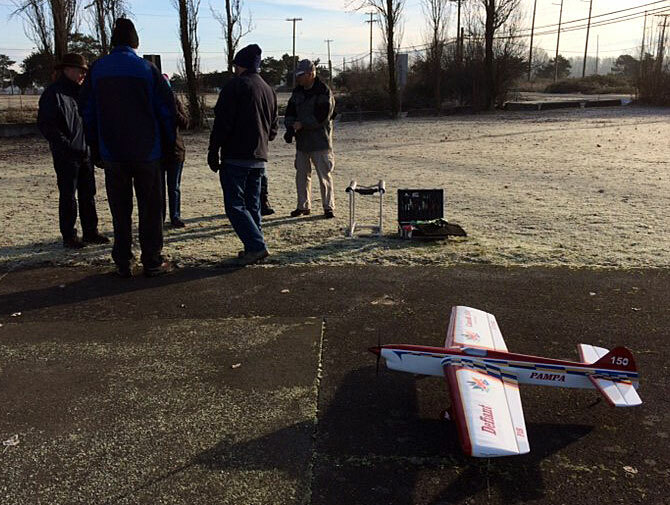 In Richmond, fliers from the Vancouver Gas Model Club and Pacific Aeromodellers Club gathered in the snow for the annual Polar Bear Fun Fly. Flying conditions were again perfect for Oregon Flying Fun No. 1, hosted by the Northwest Fireballs on New Year's Day at Delta Park in Portland. Thick fog in the morning gave way to clear blue skies in the afternoon, winds were moderate and it didn't rain. The 12 flyers put up something in excess of 20 flights, first one by Dave Royer and the final one by Terence Bardue. Including guests and visitors, we had 19 people in attendance. "First belongs to Richard Entwhistle, of Scappoose, Ore. Originally Scott Riese's Thunderbird, given to Richard. 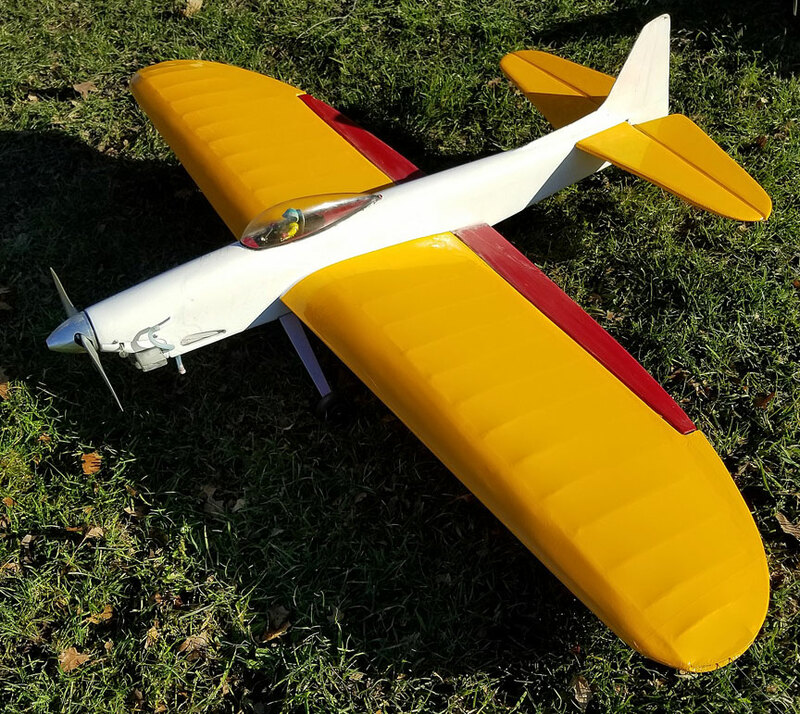 After much stripping of old and bubbling paint and total recovering from shredded covering, she made her first flight, powered by an OS LA .46 engine, with an unidentified alien pilot at the stick. "Second belongs to Don Curry (Portland, Oregon). 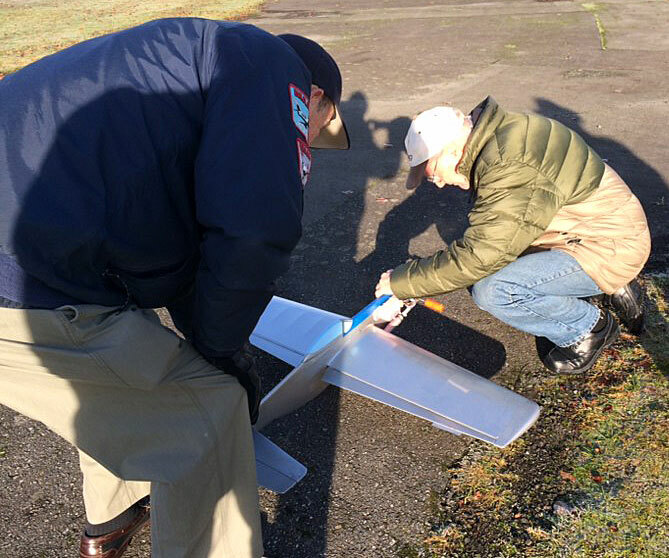 Don's plane also made its maiden flight on New Years Day, 2018. As Don did not have any drawings to work with, he built this plane entirely from images off the Internet and wood from his inventory. Don's Super Ringmaster is powered by an OS 26 4-cycle engine. Both planes flew extremely well on the bright and windless skies over Jim Walker Field on New Years day." Oldest plane may have been the garage sale Spitfire revived by Doug Powers. Coffee and cookies were available all day, with a potluck lunch around noon ... chili, soup, boiled brats, fried chicken, salad and beverages. In fact, everyone had such a good time that the event was already winding down, with some flyers headed for home, when someone remembered the prizes. The prize drawing for the 12 flyers has been rescheduled for the club's midwinter banquet, Jan. 20th. 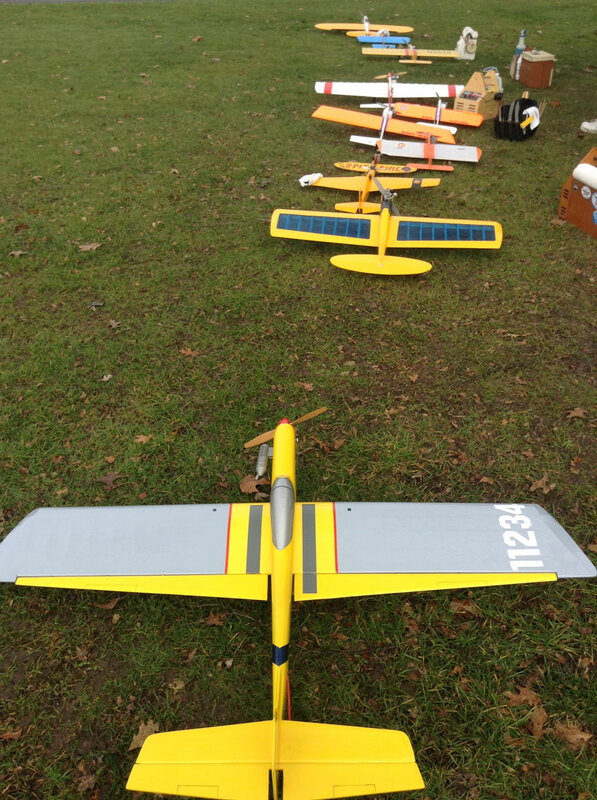 Some of the planes lined up at Delta Park. Barbara White photo. Tom Brightbill flies on Jim Walker Memorial CL Field's asphalt circle. Barbara White photo. 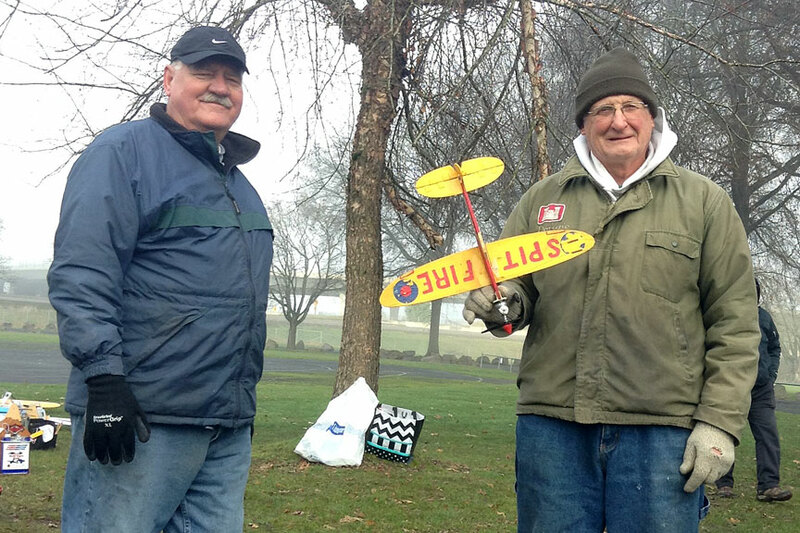 Doug Powers (right) bought this little plane from a garage sale for $1. He cleaned it up a bit and it flies well! Leighton Mangels is at left. Barbara White photo. Gary Harris flies a Combat plane. Barbara White photo. 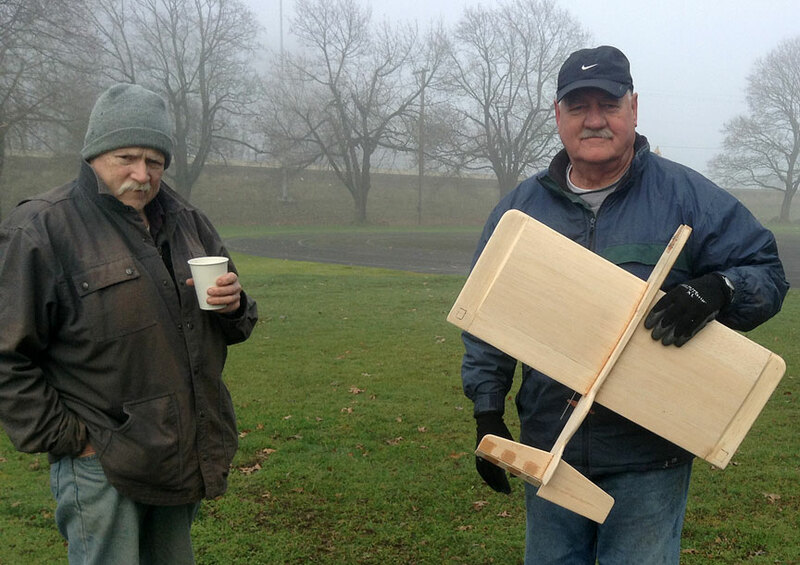 Leighton Mangels shows off an unfinished new plane in the Portland morning fog; Richard Entwhistle warms up with coffee. Barbara White photo. Don Curry brought out this brand-new plane inspired by the Super Ringmaster. Don didn't have plans, so he built the plane entirely from photos. 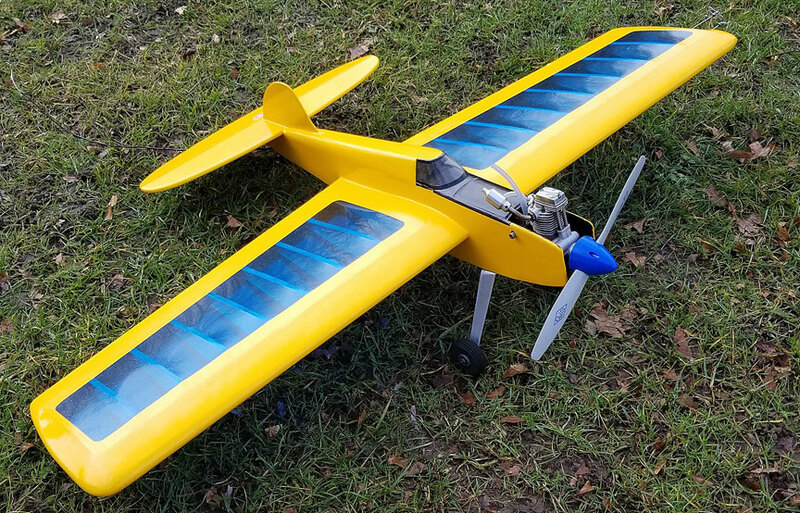 It made its maiden flight at the fun fly and flew very well with the O.S. .26 four-cycle engine. Bill Lee photo. Richard Entwhistle brought out this Thunderbird for a first flight after recent refinishing. It originally was built by Scott Riese, and powered by an O.S. .46LA. Bill Lee photo. A beautiful day, albeit a little chilly. The usual Vancouver Gas Model Club and Pacific Aeromodellers Club members came out to either fly or cheer on those who flew. I counted 12 cars in the raking lot when Joan and I headed out for breakfast. Chris Cox's Defiant awaits as the group chats alongside the Richmond circle. Chris Cox photo. 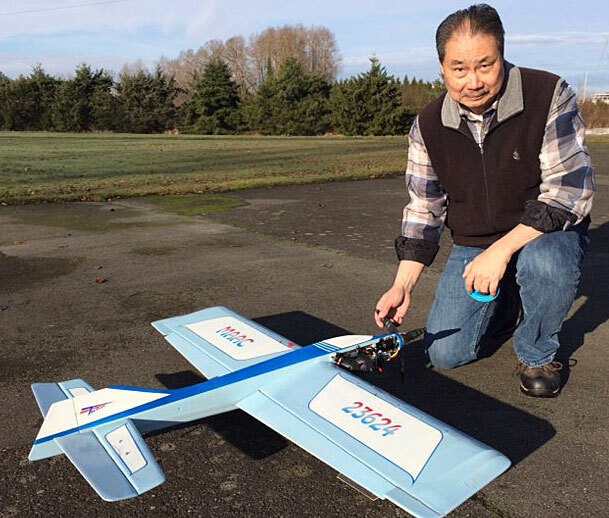 Joe Yau prepares for a flight. Chris Cox photo. 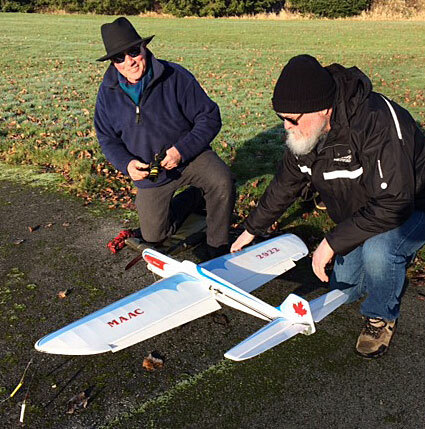 Glen Little starts his plane while Gerry Boyd assists. Chris Cox photo. And the launch! Chris Cox photo. Dennis Cousineau prepares for a start with Larry Lewin assisting. Chris Cox photo.